The Allgäu-based electronics specialist Steca announces the launch of its Steca Solarix PLI, an all-in-one hybrid inverter equipped to handle any conceivable energy situation. It is the first all-in-one solution from Steca that adapts quickly and intelligently to the respective energy supply form – and at an unbeatable price. Innovative electronics company Steca is launching its Solarix PLI, a genuine “all-around” talent in the inverter product line. This all-in-one hybrid inverter supplies consumers with 230V AC, charges the battery with an integrated MPPT charge controller and, at the same time, can connect to a generator or the existing public grid. 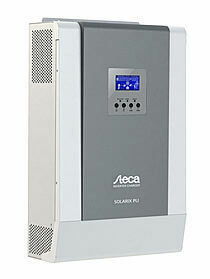 This means that solar energy, for example, can be the top- priority power supply. And if that isn’t enough, a generator can be started or the supply can 00be switched to the public grid. The battery can also be recharged simultaneously by either the generator or the grid. Given its very quick switch-over time of up to 10 ms and its flexible energy priority selection, the Solarix PLI also functions as an uninterruptible power supply. With its dual overload capacity, even the most difficult power consumers, such as large AC motors, can be started reliably. The maximum power point tracker in the integrated charge controller ensures that even in poor weather the maximum output is obtained from the PV modules. This enables the battery to be optimally charged while simultaneously supplying consumers with power. At the same time, the Allgäu-based electronics specialist Steca has also emphasized maximum user-friendliness in the Solarix PLI 5000-48. The inverter is easy to operate using the menu navigation, a graphic LCD display as well as 3 LEDs ensure that users can get a quick view of operating modes. Also, a whole series of electronic protection functions, such as overload protection, reverse current protection at night and an acoustic alarm, offer absolute reliability in every situation. Last but not least, the price of the Solarix PLI 5000-48 hybrid inverter was purposefully estimated to be aggressive so that it would be accessible to as many users as possible. A lightweight at only 11.5 kilogram, it offers an unbeatable price-performance ratio.